Hydrilla verticillata (L.f.) Royle, is a perennial or annual, submerged aquatic plants, rooted, multi-branched stems extending upwards to the water surface. Severe infestations often form dense, floating mats. Stems are slender and can grow up to 9 m long. Leaves are 6 – 20 mm long, 2 – 4 mm wide, strap-shaped with pointed tips and saw-tooth edges. They grow in whorls of 4 to 8 around the stem, leaf margins distinctly serrated and serrations visible with the naked eye. Their leaf tips end in one spine cell (as opposed to two spine cells in the indigenous Lagarosiphon spp.). Leaf colour can vary from green, translucent, yellowish, to brown. Flowers: the female and male flowers occur on separate plants. Female flowers are small and white and float on the water’s surface, attached to the female plant by long flexible flower stalks. Male flower buds develop in the axil of a leaf. When mature they are released from the parent plant and float to the water’s surface where they open into inverted bell-shaped flowers which floats on the surface. Their petals are whitish/reddish, fold backwards to lift the flowers slightly above the water. Hydrilla‘s native range includes Australia, many Pacific Islands, and widespread locations throughout Asia. Localised and disjunct populations occur in Africa and Europe. African populations in Burundi, Uganda, Zaire and Zambia are probably native; having been collected there as early as 1863. In South Africa the only known population is in Pongolapoort dam in KwaZulu-Natal. Hydrilla reproduces in many ways: sexually, asexually through fragmentation (small fragments produces its own plants) it also produces turions (over-wintering vegetative buds) in the axils of leaves, and tubers in the sediment. Tubers and turions can survive adverse conditions and remain viable for several years in the sediment. One tuber can lead to the production of 5,000 new tubers per square metre and is easily spread by anglers and recreational boaters. Hence it is imperative that boats get washed before leaving the dam to help prevent Hydrilla from spreading to other aquatic systems. The first record of Hydrilla in southern Africa was from the Nkomati River in Mozambique near Maputo in 1961. In South Africa it was discovered by Lesley Henderson of Plant Protection Research Institute at the Pongolapoort dam in 2004. The Pongolapoort Dam is part of the Pongola Catchment that originates in the northen part of KwaZulu-Natal and flows down to the Usutu River which flows to Mozambique. Hydrilla invasion to South Africa might have arrived with the boats from Mozambique which visit Pongolapoort Dam. Pongolapoort Dam is the 3rd largest dam in the country and is well known for tigerfishing competition. Hydrilla forms dense masses underwater and can grow up to 15 m deep. It impacts badly on indigenous vegetation – replacing indigenous plants; decreases fish populations and interferes with recreational activities such as the tigerfishing competition in Pongolapoort Dam. It hinders commercial and recreational use of the water, even making swimming dangerous. Major infestation can limit the size and weight of sport fish. It causes disruption in the provision of ecosystem services supplied by the aquatic ecosystem. 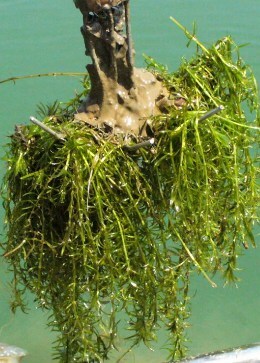 It is very difficult and costly to control Hydrilla infestations. In the USA control measures amount to millions of dollars annually. Currently there are no herbicides registered for eradicating this species in South Africa. Only a containment method is used – washing of boats before/ when they leave Pongolapoort Dam. Report sightings of these plants to the ISP team. We will need to know its locality (the exact locality, supply any landmarks or GPS information if possible). If you visit Pongolapoort Dam, please make sure you wash your boat before leaving the dam in order to prevent Hydrilla from spreading. Madeira, P.T., Coetzee, J.A., Center, T.D., White, E.E. and Tipping, P.W. 2007. 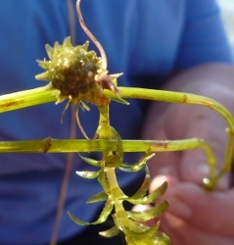 The origin of Hydrilla verticillata recently discovered at a South African dam. Aquatic Botany. 87, 176-180.